If you're not managing stress, it's managing you. Here are some tips for staying sanguine. Three out of four Americans are stressed out, with one of them facing high levels of stress, according to research from Harvard Medical School. To facility managers, that’s hardly news. 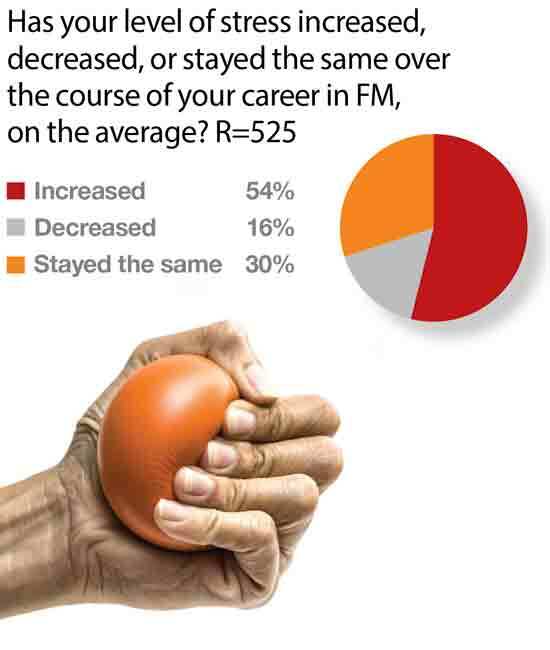 Respondents to a recent Building Operating Management survey on stress among facility managers reported that 71 percent feel they are moderately stressed on a day-to-day basis because of their job, and an additional 14 percent are very stressed. 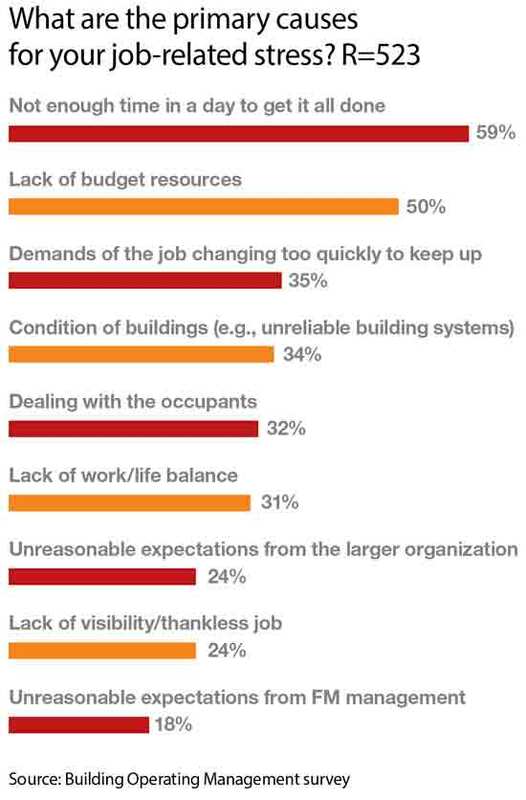 Facility management, with varied and sometimes unpredictable daily challenges, often shrinking resources, and ever increasing demands, can be a stressful job. However, these challenges are not necessarily unwelcome. Many a facility manager has described himself or herself as an “adrenaline junkie” and touted the benefits of having no two days alike. Given the fact that the demands of the job are never going to get less complicated, it is important for facility managers to be aware of their stress levels, and develop ways to cope with, and even harness, their job-related stress, both for their own benefit and for the sake of the teams they lead. 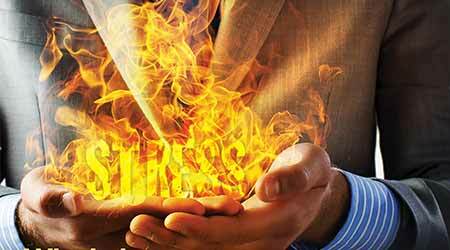 In our modern lives, “I’m so stressed out,” has become almost a throwaway phrase. But just because we’re nearly all in the club doesn’t mean it should be accepted as a normal and healthy way to live out our lives. The tricky thing about stress is that there are many sides to it. The quality, duration, impact, and perception of stress are almost as unique and varied as the people experiencing it. Here are some parameters to keep in mind when thinking about stress. • Physiology of stress. Part of the reason different people react to stress in different manners has to do with brain chemistry, specifically dopamine. There are two camps of people, those who clear dopamine from their brain quickly and those who don’t, says Crabtree. Fast dopamine clearers need excitement to do their best work. “The stress of a deadline injects their brain with dopamine, so to speak, and they clear it quickly, leaving them in a productive, focused zone,” he says. Slow dopamine clearers are left unable to focus when faced with too many deadlines or demands. They get stuck in panic mode. There is also a sweet spot on the stress continuum. People tend to think that the optimal place to be is somewhere with very low stress, preferably sipping something with a little umbrella on the beach. However, “what science has found is that the happiest moments of our life are pretty intense challenges — when we have the capabilities to meet the challenge,” says Crabtree. “If a facility manager is dealing with a very complex situation, and it’s right at the edge of his or her ability, and she or he gets completely absorbed in the work where everything is clicking and a sense of time starts to disappear, that is a zone called ‘flow.’” High engagement and a feeling of being in control are hallmarks of flow.